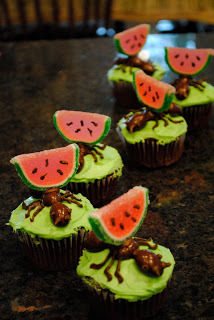 These are perfect summer cupcakes, and although spring just started I made these cupcakes awhile ago and was just reminded about them. Yesterday was a beautiful day and it got me all in the mood for summer to come. Last year I also dyed my hair a bit ombre using one of those new L'Oreal wild ombre kits and it turned out great, has me even more in the mood for nice weather, if that is even possible. 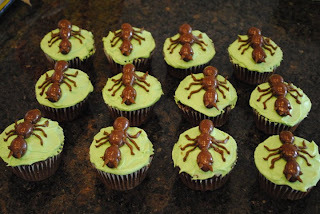 I made these cupcakes some time last year, they are just a basic chocolate cake with white icing tinted green. I should mention that whenever I dye icing green I always add a little bit of yellow because I find that it makes it a brighter green, more of a lime green. 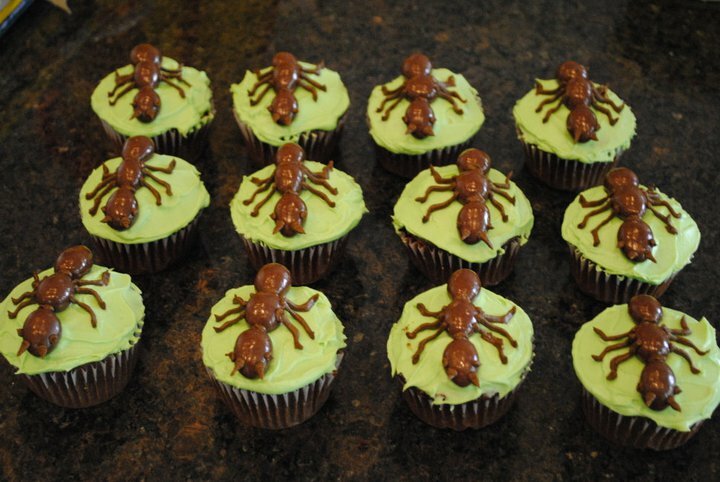 The ants' bodies are made from chocolate almonds and their legs and antlers are just piped chocolate icing. If you are allergic to nuts or are making them for a party that someone there is you could use anything that looked similar, like chocolate covered ju-jubes or make smaller ants with chocolate covered raisins. I had so many more pictures, but since my laptop got stolen in December I lost them all and had to take these ones off of facebook.